ListView Header with parallax effect in android? 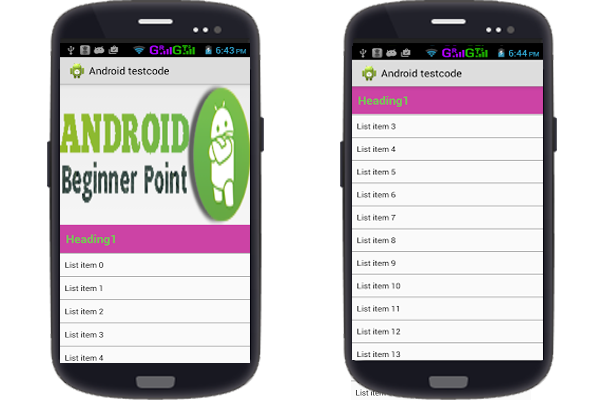 In this blog we will implement Parallax effect ListView header step by step below. The xml class create inside res/layout/ folder.the class is create a single row listview and bind via adapter show MainActivity java class. Create class inside res/layout folder. In this class declare the layout ImageView,ListView header textView and ListView in frame layout. The Create Class inside src folder.Then Initialize listview and create array adapter,whic will be used in listview. then you add header layout via layout inflater calling by addHeaderView() method and implement AbsListView.onScrollListener interface in your class. you can watch the video click here.